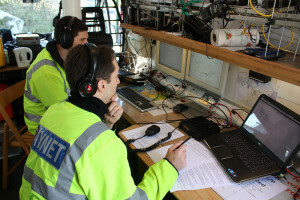 In Cambridgeshire Raynet, we recently noticed that one of our failings as a group is that only a small proportion of our membership had any experience in operating as a Control station. This reliability on particular individuals was starting to limit our flexibility and so we have embarked on a training programme in the last few months to get other members used to operating in Control. Initially, this simply took the form of a training evening looking at the duties of Control, then a training session on setting-up Flossie, the van we most often use as our Control. During the summer, we have also been rotating a number of other operators through Control at normal exercises, letting them sit alongside the ‘normal’ Control operators. One of the things we noticed, however, is that people tend to have one of two mindsets: either they are very focused on local detail (which tends to make for excellent Marshalls or Outstations), or they have the ability to consider the global picture (which makes them better as Control stations, particularly where resource management is concerned). To help our members better understand the global picture, our training session this week was about decision-making. Splitting the room into two groups of four, I presented each group with a scenario. The brief was that they were the Control station at this event, and they simply had to work out which messages they would send next, and to whom, in which order. The participants were reassured that there was no single right answer and, to simulate real-life a bit more closely, I interrupted their thoughts occasionally with extra irrelevant information. After about 5-10 minutes, we had a role-playing exercise, using the members of the other group as the outstations, to try to resolve the scenario I had set. This was a very successful activity, and was well received, so I’m making the scenario sheets the groups were given available here.